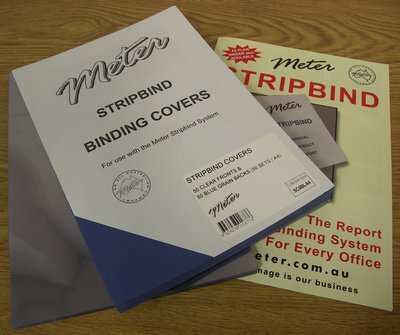 Meter A4 Stripbind Binding Covers are used in conjunction with the STBA4 Stripbind Binding System. Stripbind Binding Covers are punched with 6 holes on the side of the page and Strip Binding Strips are then inserted before being bound by the Stripbind Binding Machine closing mechanism. Each pack of Stripbind Binding Covers contains 50 Clear Front Binding Covers and 50 Coloured Back Leathergrain Covers– enabling 50 documents to be bound. When used in conjunction with A4 Stripbind Binding Strips the Stripbind Binding Covers create professional looking documents in seconds. Stripbind Binding Covers are a available in Clear Fronts and a choice of Black, Blue or White Coloured Backs.